Well, I’m trying to plow through my backlog of book reviews, and I’m making some good progress! This time I was given the opportunity to review Hannah’s Choice by Jan Drexler. I was provided a copy of the book in exchange for my honest review. 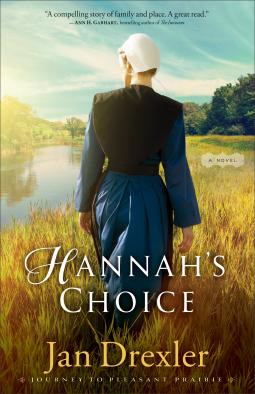 For some reason, I love to read Amish fiction books, so I was excited to pick this one, and was not disappointed! The characters are great and I enjoyed learning more about how the Amish did/did not interact with Mennonite and others in their area. Well, from reading the description, you know that there are two men that are vying for Hannah’s hand in marriage, so I’m not giving away the plot when I say that I was rooting for the one that doesn’t win in the end, but oh well! I also found it interesting that the author’s ancestors were actually among the first Amish, Mennonite, and Brethren immigrants to Pennsylvania in the 1700s. I believe this is the beginning of a book series, and I definitely would love to read more from this author. Her understanding of the historical context and her research into her ancestry makes her a great source of information, and her ability to create characters that you fall in love with is amazing.